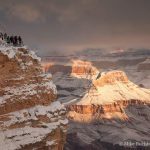 As the season starts turning cold, questions come in from readers about hiking the Grand Canyon in winter. Information tends to be scarce on winter hiking. This is unfortunate since it is such an incredible time of year for backcountry treks. The primary thing to keep in mind when winter hiking is that the weather is variable. It can be nice and sunny one day and find yourself walking in fresh snow the next. To read a story of one early April hike where this happened, read my trip report on the Clear Creek Saga. However, if you are well prepared for the elements, your winter hike can become one of the most magical moments of your life. When dealing with winter conditions, it’s hard to describe the amazing views when the Grand Canyon’s buttes and mesas are covered with a dusting of snow. Everything looks fresh and sparkling! Is winter hiking wise? If done right, it can be excellent one. 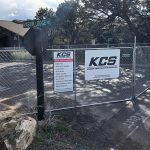 The crowds are basically non-existent, and it’s usually easier to attain reservations and meals at Phantom Ranch during the quiet winter months. Find more information on making reservations on the Phantom Ranch Lodging & Dining page. Obviously, a winter hike in Grand Canyon is much different than summer hiking and requires careful preparation. Your clothing, food, and shelter are all critical elements that can make or break your hike. But on that note, I must admit that those who hike in winter are often far better prepared than many hiking here in summer. Let’s start with clothing. As mentioned elsewhere, weather conditions can vary dramatically from the rim to the river. Due to the elevation change between the two, temperatures can range as much as thirty degrees! When you start on the rim, you may want to wear a thick fleece jacket, Goretex parka, long underwear, a hat and gloves. Halfway down the trail, you’ll find that a shirt and a pair of pants is all that is necessary. The fiber content of your clothing is extremely important. Do NOT wear cotton. Once it gets wet, cotton takes a long time to dry. This feature makes it a good choice in the hot, dry summertime when being wet is a good thing since that will help cool you down. But winter is not the time to cool down! Winter calls for the wicking attributes of synthetic fibers. Wool is an exception, but if you are at all sensitive to it, you will find it very itchy. It is also not as effective at wicking moisture away as synthetic fiber. Synthetic fibers do not absorb water, they dry quickly, and will keep moisture away from your skin. To emphasize how important this is, imagine hiking up and out of the Canyon. The trail is steep, and no matter how cold it is, you ARE going to perspire. If you are wearing cotton, it will become damp—and stay that way. As you rise in elevation, the temperatures dip lower. Just the cold temperatures alone can make you very uncomfortable, but with the added effect of the breeze (or wind) that is ever-present where the trail meets the rim, you will freeze! Once that cold air hits your damp body, it feels as if you’ll never warm up again! Hypothermia is a very real threat in the wintertime. Another important item to have along are instep crampons, Kahtoola Microspikes or Yaktrax Traction devices. The trails at the Canyon can be covered with slick ice for the first mile or two or even more. It is treacherous and scary to be slipping and sliding while walking on the edges of cliffs! However, the use of snow traction devices as those mentioned above, will allow you to actually enjoy hiking on the icy trail. No kidding! The Canyon Village Marketplace in the Village also sells instep crampons very at very reasonable prices. Check for availability to make sure they have them in stock. Their phone number is (928) 638-2262; ask for the camping department. Hiking sticks are also very useful when hiking in mud and ice. In fact, hiking sticks can be some of the most useful items you can take with you on your hike! Read my Walking Sticks & Trekking Poles for all the benefits of their use. You can check current trail conditions by calling the park’s Backcountry Office at (928) 638-7875 between 1:00 PM and 5:00 PM MST, Monday through Friday, except Federal holidays. Please note that this number is for information only. They do not take permit requests by phone. You can read more about permit procedures, as well as find more information, on the Backcountry Permit Request Form page.